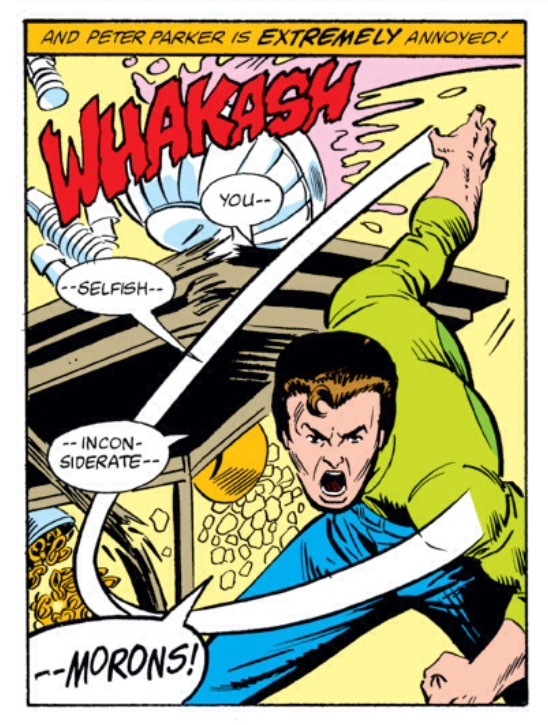 To most observers and Spider-Man fans, Amazing Spider-Man #223 is the quintessential “forgettable” issue. It marks the final installment of the lame duck Denny O’Neil-era on the book and O’Neil didn’t even script his plot, instead leaving it to a fill-in writer, J.M. DeMatteis (who was still a few years away from becoming THE JMD when it came to writing Spider-Man). 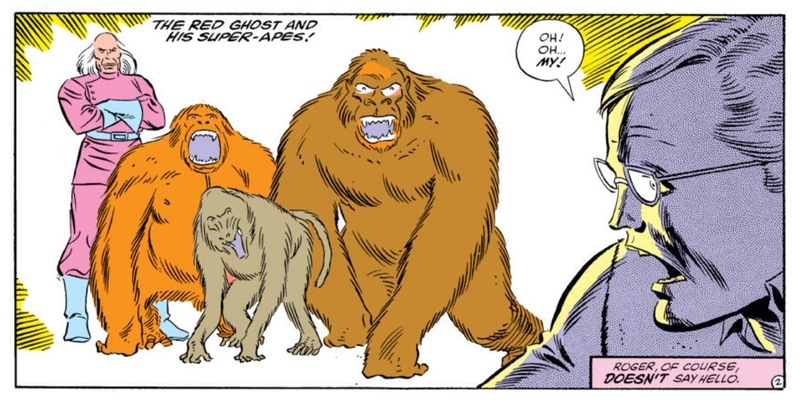 The book’s featured villains, Red Ghost and his Super-apes, are total D-listers who have rarely, if ever been a part of any upper echelon stories (save for their hilarious cameos in Dan Slott/Ty Templeton’s Spider-Man/Human Torch mini). In fact, I can safely say when I first got my hands on this comic (as part of the infamous “big box of comics” that I first wrote about more than six years ago), I quickly breezed by it as I was flipping through the longbox’s contents. Any time I spent lingering over it was done simply to take stock and inventory of the issue so I could check another issue of ASM off of my “to-buy” list. And yet, all the years later, ASM #223 has emerged as a key reminder of how my relationship to comics and the creation of comics has changed over the years. If you could all pardon the navel gazing (though you ARE reading a personal blog about a guy who studies his relationship to one superhero comic book series, so basically every single post is chock full of navel gazing) for a moment, you’ll understand why such an innocuous comic — one that wasn’t even that important to me when I first started Chasing Amazing in 2011 — has suddenly become part of my fandom’s foundation. In the summer of 2013, I got an e-mail from Dan Gvozden, who had just started the (then) Superior Spider-Talk podcast with me a few months earlier. This is not unusual by itself — Dan and I e-mailed each other quite frequently that summer (still do, in fact). However, in this particular e-mail, Dan had mentioned an opportunity for us to meet in the flesh for the first time, and to enhance the scope of our podcast in the process … by attending a comic book convention in Connecticut that August. Now here’s something that’s probably going to shock some of you. I had been reading and collecting comics for more than 20 years by that point in my life, but I still had never attended any kind of major convention; and certainly not one that featured guests such as famous writers and artists from the medium’s history. The reasoning behind this massive deficiency in my life wasn’t all that sound. Primarily, I failed to understand the actual incentives and benefits of attending cons. For me, I saw them solely as just another place to buy comics. And since I was doing a well enough job of attempting to complete my run of ASM without having to pay for the privilege of doing it at some convention center or hotel ballroom, there was never any reason for me to cough up $50 to attend New York Comic Con or any of the other conventions in the surrounding area. Beyond that, I knew cons were a big place for fan cosplay. Now, at the risk of sounding snobby or elitist, I’ve just never been a fan of cosplaying. Let me rephrase that: I have no problems with other people who cosplay, but it’s definitely not for me. I’m the same person who hates Halloween and will pretty much go to a Halloween party with a “this is my costume” t-shirt. So if I wasn’t looking to pay an entry fee to buy comics, or dress up like a superhero, what was the point in me ever going to a con? … I know. This whole thing is really stupid. Dan on the other hand was a con veteran. Near his then-hometown in Maryland was Baltimore Comic Con, an annual event he attended ritualistically. He told me about the great commissioned artwork he got there and the stories of the conversations he had with comic creators, many of whom were more than happy to discuss some random story they worked on 20 years earlier. After selling me on the merits of going to a con, we checked out the Connecticut show’s guest list and it was impressive: JMD was on the list, along with Tom DeFalco and Mark Bagley, not to mention Danny Fingeroth and Jim Salicrup, who had edited a bunch of Spider-books that I grew up reading. OK, so I was in. We were going to travel up to Trumbull, CT, and I was going to simultaneously meet the guy I had been podcasting with for a few months AND attend my first con. And then Dan went ahead and raised the stakes. A week or so out from the con, Dan mentioned that while we’re there, we should record some interviews with these creators and utilize those Q+As as content for our show. Now, keep in mind in a past life, I had worked as a newspaper reporter for five years, so the idea of interviewing someone — famous or otherwise — was not the least bit intimidating. But due to my lack of understanding of how cons were set-up, I initially pushed back against Dan’s proposal. “Wouldn’t that be overly intrusive?” I asked him. “What are we going to do, shut down their tables for 30 minutes while we ask them about Spider-Man?” But Dan, as he is wont to do, was not deterred by my amateurism. In fact, he took it one step further and said he was going to bring his laptop and microphone with him to get the best sound quality. I was kinda mortified. I thought we were going to get kicked out of Connecticut Comic Con. I thought Tom DeFalco was going to punch us in the face (he still almost did, but not because of Dan’s laptop and microphone). As a final nail in the coffin, a few days out from the event, Dan asked me if I was going to bring anything with me to get signed by these creators. So not only were we going to shove microphones in their face, but when we were done, we were going to expect them to sign our old books? When I was at the newspaper, asking an interview subject for an autograph was a major no-no. I only did it once during my career. I was working a Saturday shift covering a book signing with 60 Minutes great Mike Wallace promoting his new memoir. Wallace is (now, sadly, was) a total giant in the journalism field, but I still resisted getting his signature. However, the photographer who was working the assignment with me convinced me if I bought a copy of Wallace’s book, asking him to sign in after the interview, would not be seen as taboo. I agreed and did it. So once we were FINALLY at the con, Dan and I got the lay of the land before Dan decided it was time to start meeting some creators and scoring interviews. I was still very reluctant to go through with Dan’s plan but in an effort to cover my bases, the night before the show I e-mailed JMD via his web page and mentioned that we were going to be attending the con and would like to speak to him about his Spider-Man career. DeMatteis got back to me that night and said he’d be happy to. I didn’t mention the laptop or microphone, nor that we wanted him to sign any personal books. Still, I thought if Dan was itchy to do an interview, we should start with JMD since he was the only one there who knew of our existence. When we first approached the table, I introduced myself to DeMatteis and got a somewhat vacant look, which immediately made me panic. However, he quickly got a gleam of recognition in his eyes as I continued to explain who I was and why he should be expecting me to talk to him. Dan then took out his laptop/mic combo and I expected a look of annoyance to come across JMD’s face. Instead, he barely noticed and we had started the interview. 20 minutes later, we ended a very enjoyable conversation that covered “Kraven’s Last Hunt,” the “Harry Osborn Saga” and other famous arcs. As a final grace note, Dan took out a handful of books for JMD to sign and he did so without hesitance. I did the same. At the top of the pile was my copy of ASM #223. 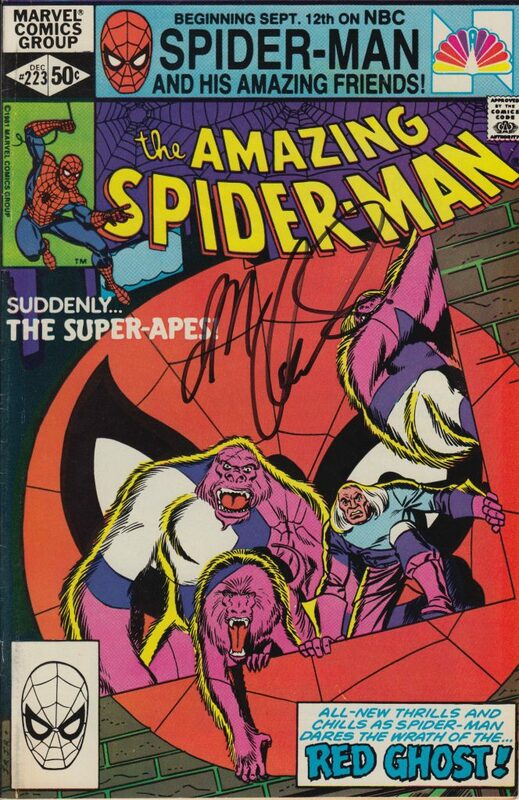 As I was deciding whether or not to ask for autographs the night before, I decided if I did go through with it, I might as well make an otherwise ordinary issue of ASM infinitely more special by getting DeMatteis’s signature on it — it was, after all, his very first ASM credit. But beyond getting some person’s signature, my first con was just an eye opening experience in terms of the behind-the-scenes sausage making of comics. I was well aware of the comic book promotional-masked-as-journalism complex, that still dominates the industry to this day. But the idea of getting into the nooks and crevices of some old story and attempting to yield some new insight or nugget of wisdom from the creator was fascinating to me. We ended up speaking to nearly everyone on our “to-do” list that day in Connecticut. All were equally gracious, even DeFalco despite his initial attempts to extort us. And out of that experience birthed a new way for me to look at how comic books are made — a perspective that played a very key role in me getting an opportunity to write my very first book. I even used some of the interviews we got that day in Connecticut for that book. Good thing Dan brought his laptop and microphone, or who knows what they would have sounded like. I INSIST on good sound quality! I remember collecting every appearance of Spider-Man (through about 2000). I started right after the death of Jean DeWolff…1986. THAT was decades of hard work and a LOT of cash. Then I had a kid coming and had to pay the hospital bills somehow and ended up selling the WHOLE thing in ONE lot (to an overseas high-bidder on eBay). The HUGE lot (multiple long boxes) went for a HELL of a lot less than what I paid for it (it went for a couple thousand, AND IT INCLUDED AF#15). I felt so bad for the price it went for, and the SHIPPING was half of what it all sold for. Now my child is a teen and I can only wish I had those comics to share with him. Buying the digital version on Comixology just isn’t the same. Your site helps me live vicariously through my past again.